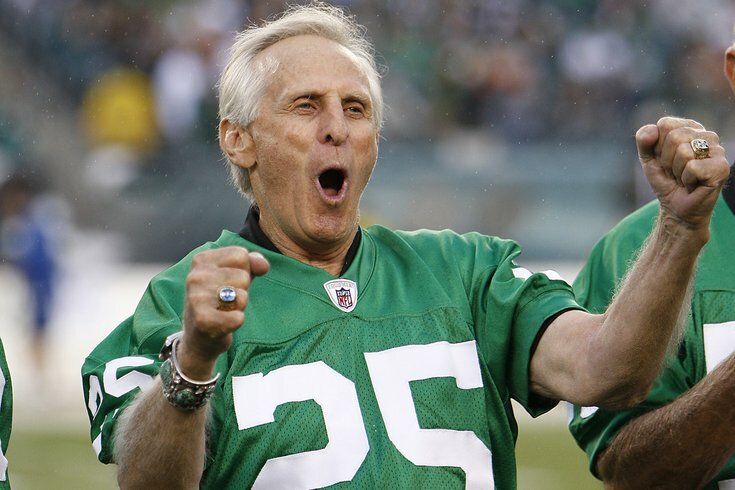 Tommy McDonald, who was part of the 1960 Eagles squad, celebrates as he was introduced during a halftime ceremony as the Philadelphia Eagles play the Green Bay Packers at Lincoln Financial Field in Philadelphia, Penn., on Sunday, Sept.12, 2010. Pro Football Hall of Fame receiver and former Philadelphia Eagle Tommy McDonald, a member of the 1960 NFL Championship team, has died at the age of 84. The cause of death is still unknown, but McDonald had reportedly been suffering from dementia-related illnesses for some time, the Inquirer reported. RELATED: Is Tommy McDonald the greatest living Eagle? McDonald came to Philadelphia in 1957. He was selected by the Eagles in the third round (31st overall) draft. That next year, he led the NFL with nine touchdowns and continued to be first or second in the league in touchdowns for four years. He also consistently ranked among the top 10 in yards, receptions, yards per game, yards per reception throughout his seven seasons with the Eagles. He was inducted into the Hall of Fame in 1988 — which makes him one of nine Eagles to do so. McDonald remains second in the Eagles record books with 66 touchdown catches, despite playing in far fewer games and catching fewer passes many of the franchises other top receivers. Nearly 23 percent of his receptions resulted in a touchdown. The announcement of his death came from David Baker, president and CEO of the Pro Football Hall of Fame. On Twitter, Baker called McDonald "such a character who lived life like he played the Game..."
With charisma, passion & had fun! Tommy’s family is in our prayers and thoughts!